Azerbaijan is one of the oldest centers of human civilization and one of the most ancient states of the world, a country with a rich and centuries-long history. One of the monuments proving this is Gobustan, where a huge number of rock carvings, sheltered dwellings, ancient man's sites, burial mounds were discovered. Gobustan, a nature reserve of the country, is considered to be one of the most attended places of Azerbaijan by foreign tourists, thus in June-September of the current year, 24,088 tourists visited this ancient part of the world. Rahman Abdullayev, member of Gobustan National Park said that 16,502 of visitors are foreign citizens, and mainly are from Russia, Germany, England, Pakistan, Iran and Arab countries. Being considered as "outstanding universal value" for the quality and density of its rock art engravings by UNESCO World Heritage Site in 2007, Gobustan covers three areas of a plateau of rocky boulders rising out of the semi-desert of central Azerbaijan, with an outstanding collection of more than 6,000 rock engravings bearing testimony to 40,000 years of rock art. The site also features the remains of inhabited caves, settlements and burials, all reflecting an intensive human use by the inhabitants of the area during the wet period that followed the last Ice Age, from the Upper Paleolithic to the Middle Ages. The site, which covers an area of 537 ha, is part of the larger protected Gobustan Reservation. The rocks of Gobustan have about 6,000 paintings, which were created from the time of the Mesolithic and until the Middle Ages. Figures (scenes of hunting, ritual dance, farming, animals, boats and various symbolic signs) are found mainly in caves and on fragments of rocks. For the first time archeological excavations began in the 1930s. Since 1965, a special scientific expedition has been engaged in studying the monuments of Gobustan. Archaeological research of more than 20 dwellings and shelters, more than 40 burial mounds, discovered and recorded up to 300 rock carvings. 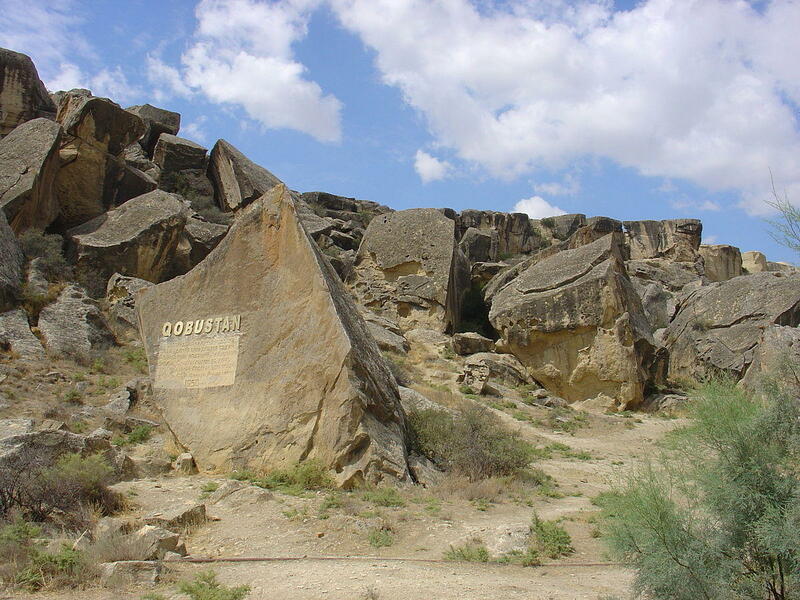 Since 1966, Gobustan is a nature reserve. A well-known Norwegian explorer and traveler, Thor Heyerdahl, repeatedly visited Azerbaijan, shocking everyone with the sensational results of his studies of rock paintings in Gobustan. He called the reserve a museum in the open air, and after studying the rock carvings there, he came to the conclusion that the Norwegians and Azerbaijanis were related. He discovered the similarity of the ships depicted on the rocks to the vessels used by the Vikings, and concluded that the Vikings had begun their journey westward from here.